A bad Artist's rendition of our originally proposed Kick-off event on July 4th, 2001. Would you have been there to see it? When we first started developing this site a couple of months ago, we had an idea for a glorious kick-off event. 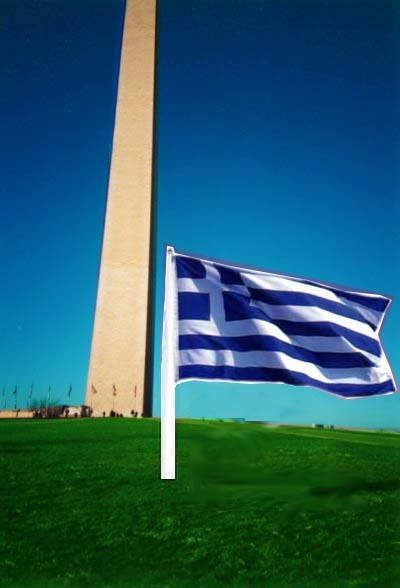 Our idea was to officially launch the site on the 4th of July by placing an oversized Greek flag on the grounds of the Washington Monument around 9:00 A.M. and wait for any Greeks who happened to be there for the fireworks and other festivities later in the day to descend on us like the cats that circle my yiayia’s yard every time there’s lamb on the spit. The Brazilians and Scandinavians in the area have been pulling this stunt for years. Unfortunately, we were nowhere near ready to unveil anything near what our site looks like today. But what if we had planted our flag there that day? Would there have been any Greeks on the Mall to see it? While the DC in DCGreeks.com doesn’t take a lot of space, it does represent a whole lot more than just the region in which we live. There’s a reason why we’ve tried to focus our efforts on Greeks in the DC area; there's a distinct difference between being Greek anywhere else in the country and being Greek in DC. Something about living in and around DC unites every young adult who lives in the area. The thing that we’re noticing though is that not enough Greeks are taking advantage of their surroundings. There is a commonality that all young adults in DC share, that somehow Greeks in this area manage to escape. In our quest to be better Greeks, we are losing our sense of what it means to be young Greek-Americans in this area. All our interactions are in stereotypical Greek settings. Ask yourself this: Where do you hang out after work and on the weekends? If your answer is Ozio, Tel Aviv, Diva or any place else where the dress code is all-black and everyone in the place kisses each other on both cheeks, you're missing out on what it means to be a young adult in this area. Don't lie, we know you hang out at Ozio. We’re not telling you to stop hanging out with your Greek friends. If you’ve been on this site, you know that’s not what we’re about. We’re just talking about hanging out with Greeks and others in less stereotypical surroundings. There is a proper balance to be struck between the DC and the Greek in DCGreeks.com. Do you hang out with friends from work? Do you spend your summers evenings playing softball on the Mall or biking along the Rock Creek Parkway? Have you ever been to the Clarendon Grill in Arlington on a Thursday, or to the Rock Bottom in Bethesda or anywhere in Washington besides the above-mentioned "Euro" places? Do you make the pilgrimage every summer to Ocean City or Dewey Beach for a weekend? When's the last time you've been to the Smithsonian? Have you been along Skyline Drive in the fall to see the colorful foliage? And finally, would you have been on the Mall on the 4th of July to see our flag? 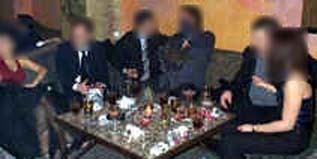 Through the efforts of our local YALs and other organizations, we have started to see Greeks hanging out with each other in less Euro surroundings. We have to say that this past weekend was a great example of Greeks hanging out together in more relaxed environments. On Friday night, St. George's YAL organized a Happy Hour at Sequoia. Now say what you will about Sequoia being overpriced and full of way too many DC lawyers, but you know what, it's no Ozio. I didn't have to leave there having to wipe off four sets of the same lipstick marks off my cheek for every girl, (For those of you playing at home, that's 1. Right cheek hello, 2. Left cheek hello, 3. Right cheek goodbye, 4. Left cheek goodbye), not everyone was on a cell phone, only one girl was chain-smoking, and if you had yelled out the name "Maria," not everyone in the place would have turned around. St. Sophia's had a BBQ on Saturday afternoon. That's right, a Greek event that started before sunset and was over by 8:00, and the only one wearing black was a lazy frisbee dog waiting for leftover store-bought burger meat that fell off the Grill. Notice I said grill, not spit, and burger, not gyro. St. Katherine's YAL has been having a monthly get-together at the Clarendon Ballroom in Arlington on the third Friday of every month. You know just by walking into this place that this can't possibly be a traditional Greek venue because 1) it's a non-smoking environment and 2) the closest thing to a Middle Eastern rhythm that has ever been laid down by the likes of such artists as DJ 2Nutz or your average Dewey Beach band, is Missy "Misdemeanor" Elliot's, "Get Ur Freak On." A couple of the most refreshing events we have been to in the past year were the Greek Nights thrown by the GW Kosmos Club in GW's Student Union building. Even though it had some elements of a Greek Night, (i.e., a DJ playing that song "Krata ta ola ta pragmata mou," which when you're hammered sounds like, "Crack, Coca-Cola, ta oneira mou, which I always thought was a cool name for a song), everyone was casually dressed, and not only was there no smoking, but no drinking either. They had 9:00 start times, and surprisingly, a great majority of the people were actually running on Eastern Standard Time, and not Greek "Show Up after Midnight" Time. Black ribbed Polo Shirt... $12. Looking like every other guy at Greek Night... Priceless. We look forward to seeing more of our members posting events on our events calendar that aren't "traditional" Greek events. We've said this before, that we here at DCGreeks.com believe that a Greek event is anytime two or more Greeks are gathered in one place in the spirit of friendship and parea. There is still room in all our lives for the traditional black-clad, smoke-filled, loud and crowded Greek Nights that we all love, and we'll certainly be posting and accepting postings for those events on our calendar. (Where else am I going to have a chance to wear my $12 clearance-priced, size-too-small, black-ribbed-buttonless polo shirt from Macy's?) But always remember to take time for the DC in DCGreeks.com. Click here to read last week's column.